Built on a metal base is a single curvy body made of polypropylene. Spacious and comfortable, the seat fits easily in the kitchen and in the dining room. Also ideal in public and community spaces, from clubs to restaurants, to waiting rooms. Holm therefore adapts easily to every situation and coexists easily with many tables in the catalogue. Seating system with shell in polypropylene reinforced with glass fibre. 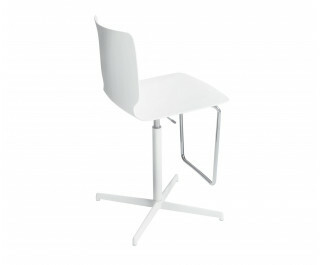 Polypropylene finishes: white, anthracite, sand, turtle dove or covered with leather, eco-leather, cowhide or “cuoietto”. Base: 4 legs in steel tubes (stackable), steel sled base (stackable), swivelling base (non-stackable).